I've been meaning to post some progress shots of the first two quilts on my bucket list for 2018 since the end of January-- but instead of blogging about them, I've actually been working on them which is a good thing! So today I'm sneak peeking "Dot Almighty," and later this week I will show you my flower basket piece. I spend a lot of my sewing time deciding on names for my quilts, and when you see where they take you, the name can frequently change! So "Dot Zero" has been rechristened "Dot Almighty" when I realized what a coffee worship piece this was turning into. "Dot Almighty" is going to be shown at MQX East--along with "A New England Album," so don't miss the show! 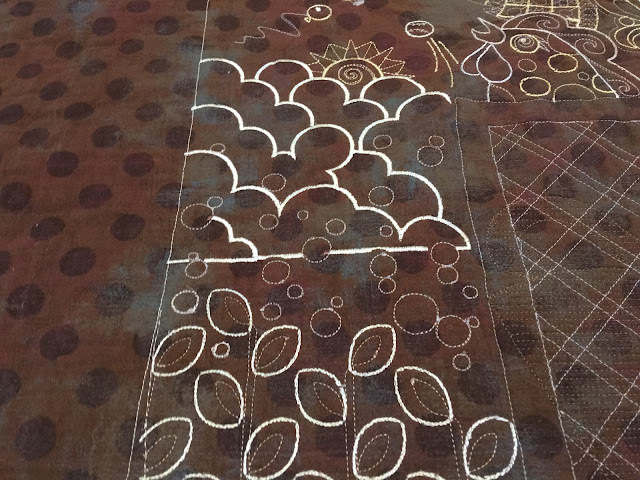 I have been putting an hour or two in at night to get Dot Almighty quilted, but I better step up the effort-- time is getting short. The first thing I did was add just the batting, and I stitched in the ditch around all of my snowballs. There is that funny saying we have that mistakes will "quilt out," but I was so proud of my piecing in the dots that I definitely wanted to "quilt them in." 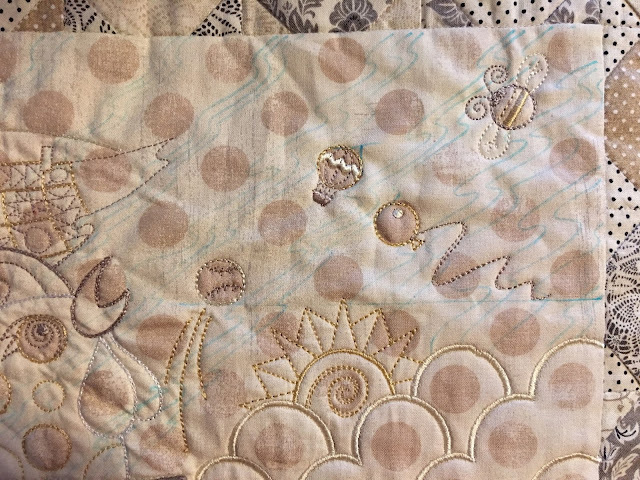 I have not been an avid stitch-in-the-ditcher, but now that I see how it preserved my piecing, I'm hooked. When you consider this piece is going to be hooped and then heavily embroidered, the piecing really needs the extra help. At the same time, I don't want the ditching on the back so I added the backing after that was done. The first hooping was the coffee cup shadow-- this started as a mug rug and I thought the shadow very cleverly showed the side view of the mug. 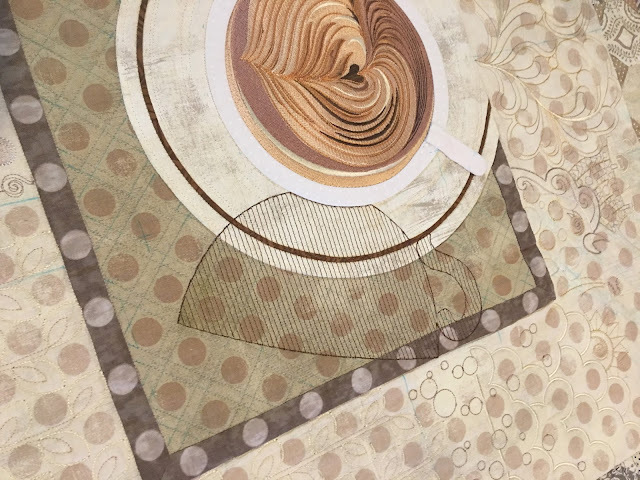 It hooped and stitched beautifully, and the shadow met the side of the cup perfectly. 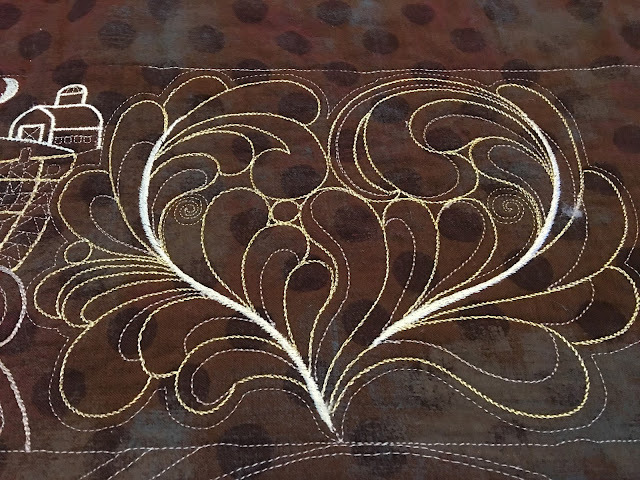 Forgive me a moment of pride, but you won't see any more perfect 1/8" matchstick quilting than machine embroidery! 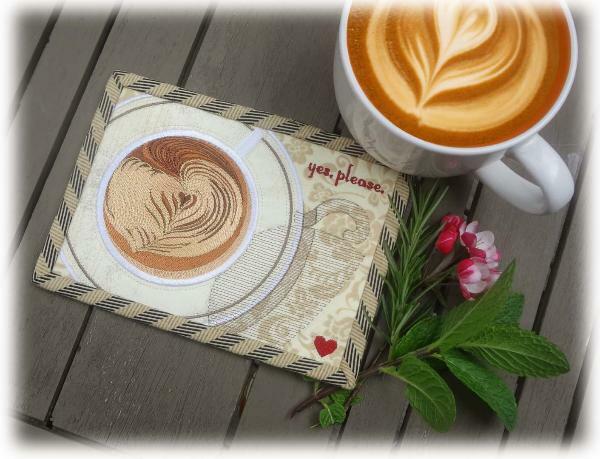 The mug rug was 1/16." 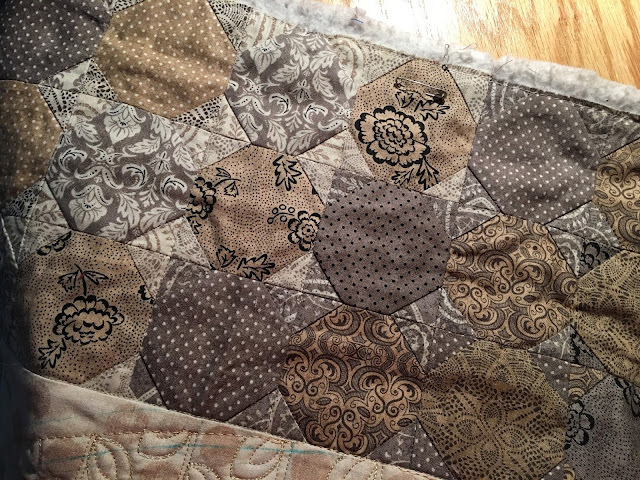 I made a decision early on that the quilting would be the kookiest, craziest that I have ever done. So it wouldn't be distracting on the front, I used light thread colors... so most of these photos are on the back. I think it's cool that from across the room it will look to be one thing, but the closer you get, you can find more and more. So if I see a bunch of noses pinned up against it at the show, I will consider it a success! 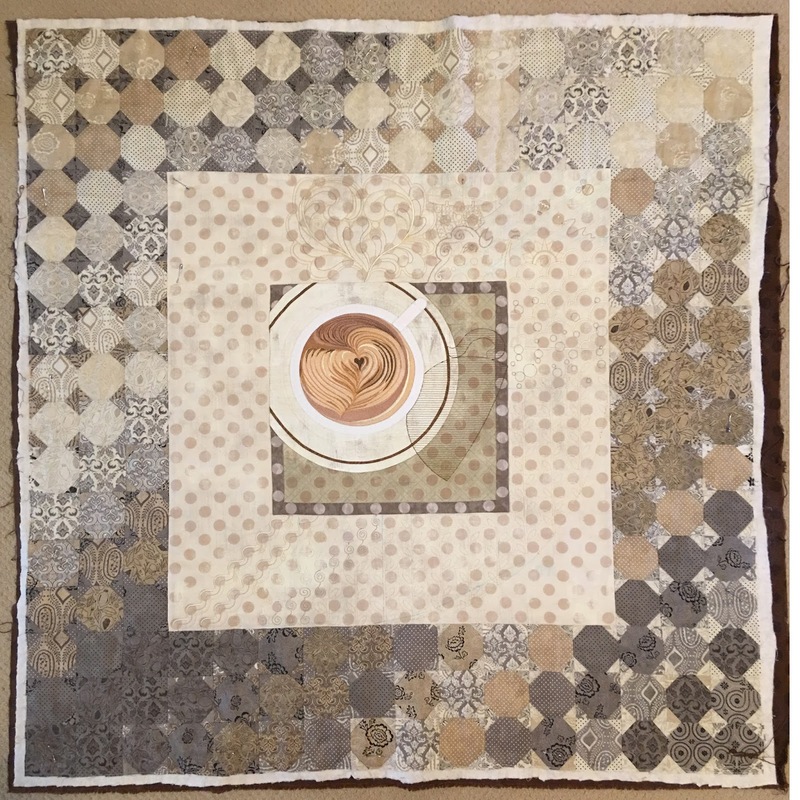 With every sunrise, it's time for coffee and for roosters to crow... and if you have a rooster, of course, there is a farm, and then a quilt hanging on a line. In the sky, there a various polka dot shape objects (they are perfectly centered on the polka dots on the front) a balloon, baseball, bee-- alliteration not intended. With a rooster, there are feathers, and this one also makes the steam rising above the coffee. That was planned, but there have been a few happy accidents along the way-- it does look like the oxygen bubbles are spilling out of the shadow! I discovered a new quilting pattern along the way... I'm calling it "Bacon." Because everything is better with bacon, isn't that right! 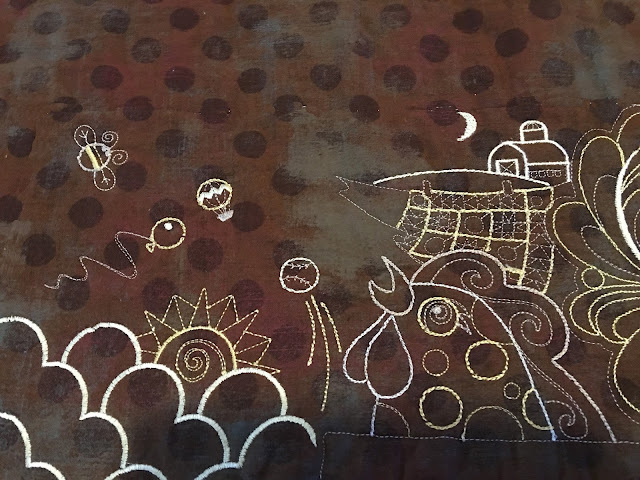 If you are interested in the process, I actually put the quilt on a copier, print out a portion of it, and then sketch the illustrations. 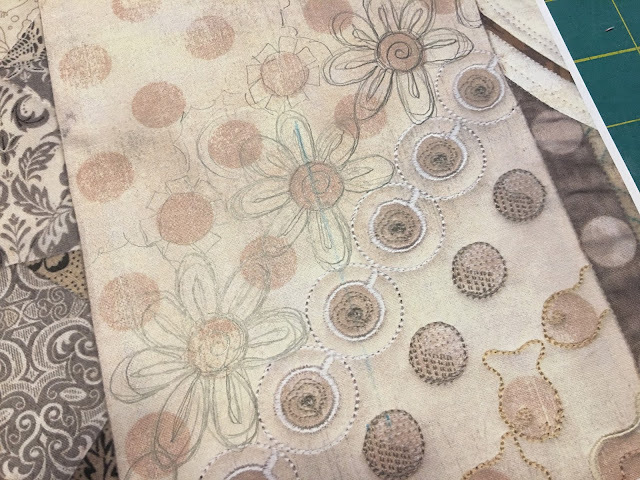 Then, the drawing is scanned and digitized in my embroidery software, hooped, stitched, finished, and then scanned for the next section. Repeat. Repeat. Repeat. Repeat. Repeat. And repeat. So that is my stream of consciousness approach for this quilt. I'm about 2/3rds of the way around, and am moving next from the sun into the moon and stars, satellites, and there is going to be an alien spaceship-- they come not to conquer us, but just to stopover for a cuppa joe. Welcome to my world! I realized when I got the MQX letter in, I better step-up the hour at night schedule, and start putting in whole days. So if anyone out there thinks that machine embroidery is easy, just pushing a button, I wish they could see me dealing with massive threads to be hidden, hooping a large, unwilling object, difficult alignments, etc. etc. My moment of pride is long gone, and now, I just feel like I want to take a match to this thing!! I'm sure all creative types can relate. So that's "Dot Almighty." I realize it's not the convention to detail your show quilt before the show, but why be conventional? I seriously doubt anyone will copy my approach heehee... Nonetheless-- that's the last peek-- next you have to come to MQX East! Touching is not allowed, but I haven't heard anything against pinning your nose up to it... enjoy! Wow! and Amazing!! I love it, but I won't be begging you to let me do this one too. It will definitely be your next Masterpiece. I love how you told us what goes into the behind the scenes process. I'm sure this will be a winner, as well. Wow! That's really amazing. What software do you have? What size hoop are you using? How the heck do you hoop a quilt? I thought they were floated when doing work like this. How do you align things? 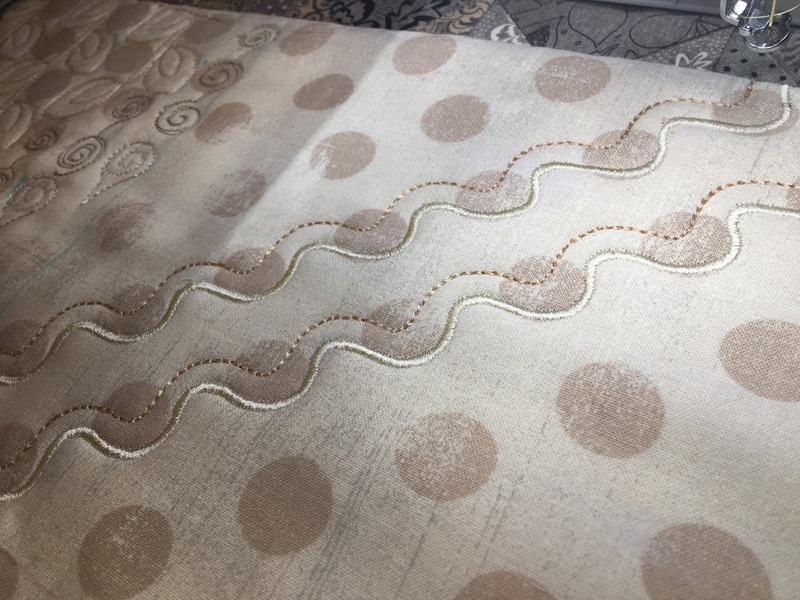 When you say "massive threads to be hidden," do you mean that each teardrop (in the last photo, for example) has to have the tie-off threads buried? Thanks for explaining! Why do you have to unhoop to change colors? Or do you mean that you have to remove the hoop from the machine (so you can get to the bobbin)? 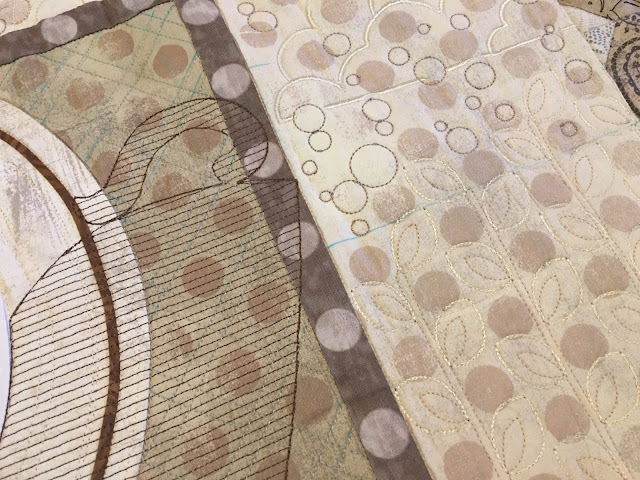 When digitizing for quilting, what sort of adjustments do you make? For example, do you use a longer stitch length? Yes, the bobbin used is always the same color as the top thread. 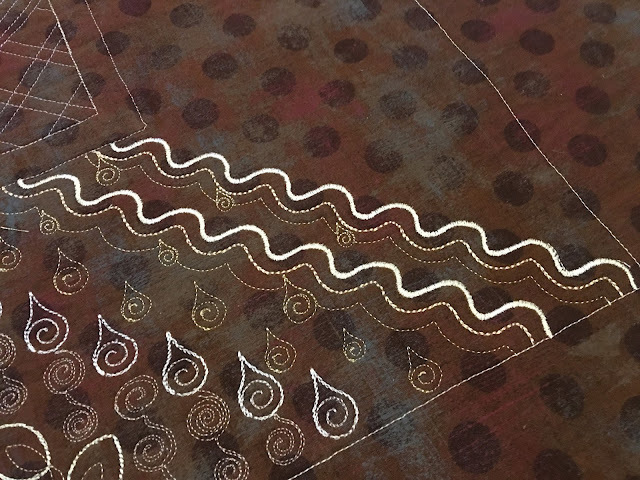 It is possible to make amazing tight, hairpin curves and incredible acute angles so that stitch lengths are very much shorter on the whole-- I'm also experimenting beyond a single stitch and using different types of backstitching and even satin stitching for wider, more expressive lines. Very much interested to see what the judges think of it! What type of quilting do you do? 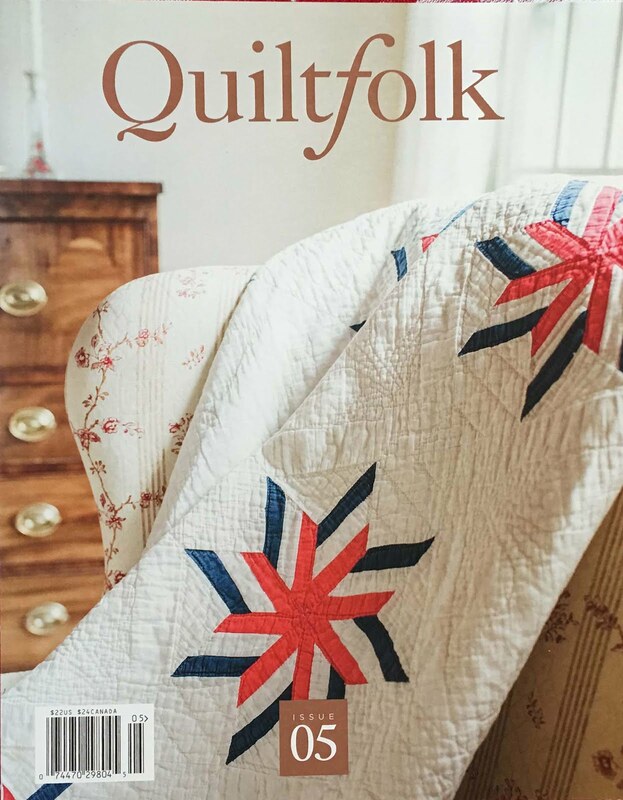 I’m a chicken quilter — I have the patterns and fabric, but I haven’t tried making anything! ;-) Hopefully I’ll work up the nerve and commit rotary cutter to fabric soon! LOVE IT!!!! Wishing you the best at MQX. Carol, have you ever considered converting some of the quilting designs for us computerized long arm quilters? Beautifully designed and executed!